Liberia was once Africa's longest-lived republic but successive coups and 14 years of civil war have taken over 200,000 lives and devastated the country's infrastructure. 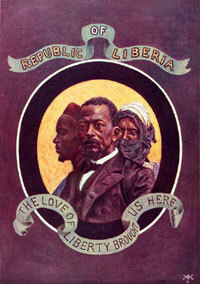 Liberia was one of the few African nations not colonized by European powers during the 19th century. That status was gained by the country's long-standing, close relationship with the United States  which began sending freed slaves to what was then the Grain Coast in 1820. In an attempt to deal with the increasingly fraught question of freed slaves, the American Colonization Society (ACS), an alliance of slaveholders and abolitionist Quakers, advocated "repatriation" to West Africa. Originally the Society attempted to fund the project by selling life memberships. But the Society's members also pressured Congress and the President for support. In 1819, they received $100,000 from Congress and in January 1820 the first ship, the Elizabeth, sailed from New York headed for West Africa with three white ACS agents and 88 free blacks. The ship arrived first at Freetown, Sierra Leone then sailed south to what is now the Northern coast of Liberia and made an effort to establish a settlement. In 1824 American agents were employed to govern the area and the capital Monrovia, was named in honor of President James Monroe. More than 2,600 freed African Americans migrated to Liberia over the next decade. Of course, there were already people living in the area and frequent skirmishes plagued the early settlements. 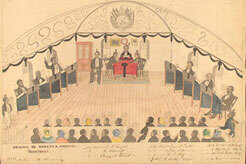 As the illustration to the right, entitled "The Shield and Emblem of Liberia as They Might Be" shows, hopes were high that indigenous peoples and freed slaves would come together to create a republic. Today Liberia is mostly made up of indigenous Africans, with the slaves' descendants comprising 5% of the population. The independent nation-state of Liberia was created in 1847. The first black governor of the colony was elected president of the republic. Only in 1862 did the U.S. formally recognize Liberia's independence, having withheld recognition because southern states would not accept a black ambassador in Washington, D.C. In addition to historic ties the United States also had economic and military reasons to maintain a close relationship with Liberia. In 1926 Firestone Tire and Rubber Company of Ohio opened a rubber plantation in Liberia. An agreement with the Liberian government allowed Firestone to lease one million acres of land for 99 years and to exploit any materials found on the land. The plantation employed 25,000 workers, and Liberia accepts a five-million-dollar loan from Firestone for a 40-year period. Liberia was seen as an important military bulwark in World War II. A base was constructed near Monrovia for refueling and maintaining U.S. military aircraft active in North Africa and Europe. 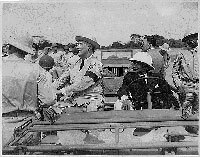 At the height of the war, in 1943, U.S. President Franklin D. Roosevelt stopped in Liberia on his North African tour to visit U.S. troops. During the Cold War the country's importance to U.S. interests remained high as proxy wars flared throughout the continent. 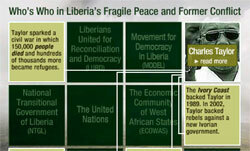 Years of conflict for Liberia began with an economic downturn and a coup led by Samuel Doe in 1980. In 1989 Libyan-funded and former Doe-supporter Charles Taylor, the National Patriotic Front of Liberia (NPFL) invaded Liberia from the Ivory Coast. The invasion began a brutal civil war that lasted seven years and resulted in the deaths of more than 200,000 Liberians. The players in Liberian history and politics over the last several decades are complex. PBS's FRONTLINEWORLD created a helpful graphic to untangle the relationships. "There is no other description because when you read about hell, there is nothing explicit about the word 'hell' that says joy. And that was the life we lived, no joy. You wake up in the morning and you're just wondering what is going to be different today? Am I going to be shot as I walk the streets? Or is my younger brother going to be conscripted? Or am I going to be raped? You know, every day you wake up and there was one terrible thing after the other. Seeing people being taken off the line and being killed, and early morning someone comes to you and says, 'Remember your classmate you graduated with three months ago? This morning the entire family was slaughtered.' Those were the kind of things we grew up with. There is no description, there is no way that you can call this life. Death, at one point, was better than life." In 2003 Taylor quit under international pressure and went into exile in Nigeria. A transitional government steered the country towards elections in 2005. Taylor is currently facing war crimes charges. Ellen Johnson Sirleaf was elected president of Liberia in 2005. She had been threatened with imprisonment, if not death, by both Doe and Taylor regimes. There are more than 10,000 U.N. peacekeeping troops still on the ground in Liberia.